This Inguinal Groin Hernia Belt is designed to provide relief from a reducible inguinal hernia - post or pre-surgery. It will provide you with the support and comfort needed to maintain your active lifestyle. Equipped with a removable soft pad that applies gradual pressure and support to the weak muscles of the groin with focused compression on the hernia. The pad can be removed as per individual needs, if only mild pressure is required. With no metal parts, it is discrete and will go undetected through metal detecting scanners. Can also be used while swimming or showering. 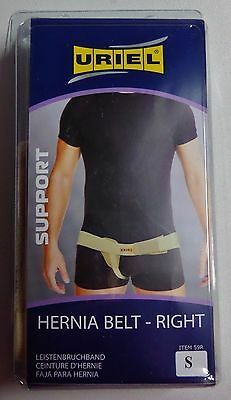 Recommended to wear post or pre- inguinal hernia surgery. Also recommended as a preventive brace for occupations involving heavy lifting. After swimming please rinse the belt properly. Lie on your back and massage gently the hernia swelling until it returns into the abdominal wall. Place the hernia belt low on your abdomen with the pad exactly over the spot where the swelling was. Still on your back, fasten the leg straps. It is not advisable to wear the belt directly on the skin. In case the swelling persists, discontinue use and seek medical attention.